Boise, ID – In order to defend fisheries on the Salmon-Challis National Forest, Western Watersheds Project filed a lawsuit today against the U.S. Forest Service for its authorization of harmful livestock grazing in Idaho’s Copper Basin. Today’s suit challenges the Forest’s authorization of grazing between June and October within the headwaters and tributaries of the Big Lost River, a popular fly-fishing destination that is home to a variety of fish species including mountain whitefish and sculpin. Copper Basin, Idaho. Copyright Ralph Maughan. This big mountain valley could be another wildlife full Lamar Valley like in Yellowstone. Monitoring data from Copper Basin show degraded aquatic conditions and violations of use limits on vegetation. Furthermore, many of the allotments in the area have had cows grazing when they are not authorized and . Despite years of grazing abuse, the Forest Service has failed to take action against many of the permittees or enforce the few closures it has ordered and the stream conditions have continued to deteriorate. Photos of grazing impacts in Copper Basin’s riparian areas can be seen here. Good for WWP to try to make the Forest Service adhere to laws such as the Clean Water Act and to make sure streams are in “proper functioning conditions” (ie. stable stream banks, healthy riparian vegetation, fine and coarse material in stream beds and sufficient large woody debris to create pools). I was appalled when hiking in the San Juan Mountains in Colorado to see cattle destroying streams on Forest Service managed land. When I questioned the agency, they basically told me the permittee had a long term right to graze cattle and that he was not required to keep the cattle out of fairly large streams. It’s too bad that lawsuits are needed to make sure “business as usual” is not SOP. Thanks for your opinion. I find it doubly hard to take this non-enforcement when the value of grazing on these public lands has so little economic value. 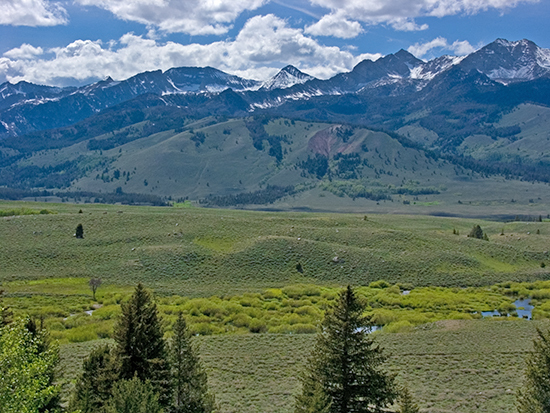 Copper Basin has just as much wildlife potential as any place inside Yellowstone Park, such as Lamar Valley. Justice in America is certainly different for certain elites (and not just rich elites) than for the rest of us. I think much of it is a “myth of the West” that rugged, arid, and harsh lands is the natural place for cattle grazing. We can blame much of that on the fake West as shown or portrayed in “Westerns.” The public is conditioned not to see or to learn about the marginality of these operations. The views of WWP and Prof. Maughan are subjective in their context and objective to coerce the IDFG, FWS, and ranchers in the vicinity of Big Lost River to discontinue all grazing practices contrary to what and how genuine Idaho interests manage, graze, and care for the Idaho environment. WWP and Maughan are using junk science and policy (junk policy) to instigate their narrow objectives of how they think public lands should be managed. Indeed, a counter suit could be filed to compel WWP to expend their resources defending their lawsuit. The public agencies cannot engage in such counter actions because they must adhere to policies such as ESA, Clean Water Act, and other nonsense supported by interests like WWP and Prof. Maughan. What do the citizens of Idaho really want? Tom, it is not so apocalyptic to insist that the headwaters of the Big Lost provide for both rare and sport fish. It doesn’t take any science, junk or otherwise, to know that folks in Idaho love these mountain streams and spend many days and much more money than the handful of arrogant ranchers who exist off the public trough. You need to learn to share a bit. This doesn’t seem like a narrow objective to me. The photos of grazing impacts speak for themselves Tom Baker. I don’t have to go far to see the same degrading conditions here in Montana on public lands. What does the law -NFMA and FLPMA- require? What did the FS commit to in its planning process for improving water and air quality? Are grazing permits being violated and is there environmental degradation as a result? And, of course, the decision-maker here is a federal judge, not someone with a vested interest in suckling off the teat of federal lands at the expense of everyone else. As for the “junk science,” the adversary process allows for the other side to discredit whatever is presented, and offer evidence of their own? So, go for it Mr. Baker. Western Watersheds made this comment on the filing of the case. “Western Watersheds Project filed a lawsuit today against the U.S. Forest Service for its authorization of harmful livestock grazing in Idaho’s Copper Basin on the Salmon-Challis National Forest. This popular fly fishing destination is home to a variety of fish species including the mountain whitefish and sculpin, and yet the Forest has let excessive grazing degrade riparian areas year after year. Same thing – doesn’t using the public lands come with some kind of obligation to protect the lands on the user’s part? The Idaho Mountain Express (in the Wood River Valley near to Copper Basin) has an article about the suit and Copper Basin today.